Despite having bowled for more than two sessions without taking a wicket on day three of the second Test against India, Mitchell Johnson believes Australia can still put together a charge for victory in Bangalore. "We'll be pushing as hard as we can," he said, when asked at a media conference about his side's chances, following the close of play on day three of the second Test. "We are looking to win Test matches. We saw today that there were a few that stayed low and a couple that jumped off the wicket as well. There was talk of this wicket and how it breaks up a little bit as well. I guess the sun hasn't really come out and broken it up for us as much as we would like, but we've still got two days to go - it might keep breaking up more and more as the Test goes on. "I'm confident we can go out there tomorrow, push really hard to knock them over, then we've got to bat really well and then fight really hard on the last day to win the Test match." To stand any chance of a series-levelling win, Australia must perform better than they did in the morning session of the day three, and Johnson admits that their performance left a little to be desired as they allowed Murali Vijay and Sachin Tendulkar to make progress during a 308-run stand for the third wicket. "We were probably a little bit flat, when you look at it," he conceded. "I think when we went out there we were probably tryng a bit too hard and it didn't work for us. As the day went on, their guys batted very well - Vijay and Tendulkar - on that wicket, so I think we stuck to our plans pretty much most of the day. "There were a couple of occasions where we probably didn't execute ilke we wanted to - it worked in their favour a bit so there were times when we went at them pretty hard with a lot of short stuff, really just tried to unsettle them and try to get a wicket. 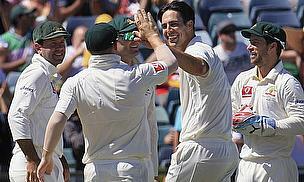 "We got some wickets at the end of the day and we're still ahead on the scoreboard. It'll be a tough morning tomorrow but if we can get a few quick wickets, just be as patient as we can, maybe we can have a lead at the end." Tendulkar's innings has seen him pass both 14,000 Test runs and register his 49th Test century but Johnson enjoys the challenge of taking on the world's best batsmen on their own pitches. "It's tough out there in Test match cricket on wickets like that," he said. "[Tendulkar has] scored 14,000 runs so obviously it's pretty hard yakka out there. "I said before this tour, and when I arrived here, that I enjoy the challenges of these wickets and coming up against such great batsmen. It's always a great challenge but it's not disheartening. We stuck to it out there and we're going to keep fighting hard in this Test match to win it." India will resume the penultimate day of the series 1-0 up and in a position of 435 for five in reply to Australia's 478.